The game is changing when it comes to hospital design. Designers and architects are more in tune than ever about how integral design choices are for patient wellbeing. Hospitals all around the country are taking steps in a new direction by cultivating a positive atmosphere through intentional design — and we’re all for it! Here are a few trends hospitals are using to soften the sterile look of traditional facilities. Out with the greys and blue, in with the light and bright. We are seeing hospital design replace traditional, more conservative tones with brighter swashes of colors as accent walls in patient rooms, common spaces, and even often-overlooked hallways. 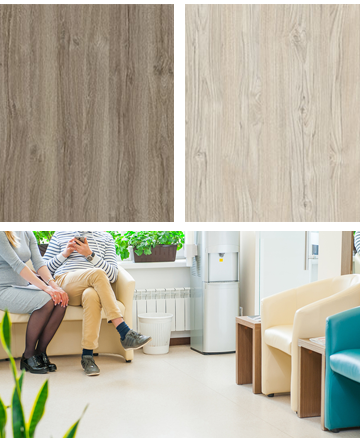 Arclin’s Angkor Root or Kinabalu Teak are two choice ideal for creating a clean, modern backdrop to whatever bright color a hospital chooses. Hospitals are going green and seeing results. Not only are they using more sustainable material like TFL because of its durability, germ-resistance, and zero-emissions, but they can reduce costs by using more TFL in more places. From furniture to built-ins, wall-coverings to shelving, the TFL can create a clean, consistent space that has minimal impact on the environment and is sensitive to patient needs. Hospitals require a certain level of clinical functionality. However, creating an at-home feel can increase patient satisfaction by making design choices that result in reduced environmental stressors. This is being done through softer linens in sophisticated colors, sturdier and matching in-room furniture such as wardrobes and bedside tables, and accenting patient rooms with greenery and artwork. By creating a more residential feel, patients have a more positive experience. Texture is showing up everywhere in commercial design right now, and hospitals are finally coming on board. While a clean and crisp style has always been a go-to in hospital design, we’re seeing warmth created by adding wood patterns to wall design, lighting fixtures, and ceiling coverings. In the high-stress environment of a hospital, texture can help create a more relaxed, comfortable environment.